Psakhis's witty style shines on every page of this profound yet accessible work, which will entertain as it instructs. Psakhis helps the reader understand a complex subject by splitting it into separate themes by opening or pawn structure. Many puzzle positions are included so the reader is fully involved. Lev Psakhis is an Israeli grandmaster. He was born in Russia and twice won the immensely strong Soviet Championship before moving to Israel where he has also been national champion twice. Psakhis is a renowned coach who has worked with many famous players including Garry Kasparov and the Polgar sisters. "This book is absolutely superb. 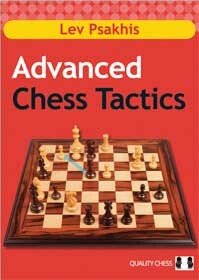 For serious players, those rated above 2200 and aiming for more, this volume will provide a wonderful breadth of study material and act as a workbook to advance your skills and understanding of this important topic... Quality Chess consistently publishes volumes that are incredibly advanced and truly of interest to stronger players or those aiming to reach that category. My assessment of this book: 6/6"
"By adding Psakhis to their list of authors Quality Chess has made another excellent move, as in Advanced Chess Tactics the Israeli GM has succeeded perfectly in putting his gigantic experience and knowledge down on paper. My positive view of the book is partly due to Psakhis' breezy writing style. Many (educational) books on the chess market present their content in a dry way, giving just variations and advice. Psakhis certainly can't be accused of that. Undoubtedly his younger students have benefited from their cooperation with this living chess legend and I expect a lot of people will profit from reading Advanced Chess Tactics. The material on offer has been carefully selected and checked by the engines. Of no less importance is that Psakhis' enthusiasm and instructive comments make sure this book will be a source of inspiration in your future games. An absolute must for anyone who's aiming to improve his tactical abilities in a structured manner!" "The games are brilliantly annotated, and as you'd expect the notes get more thorough as the games get more complicated. No doubt Psakhis checked his work with an engine, but they are the comments and notes of a very strong practical player with an eye for the beautiful." "Psakhis writes with great enthusiasm, as someone who clearly loves the game and enjoys playing, analyzing and the people with whom he shares the profession. I found his enthusiasm infectious."